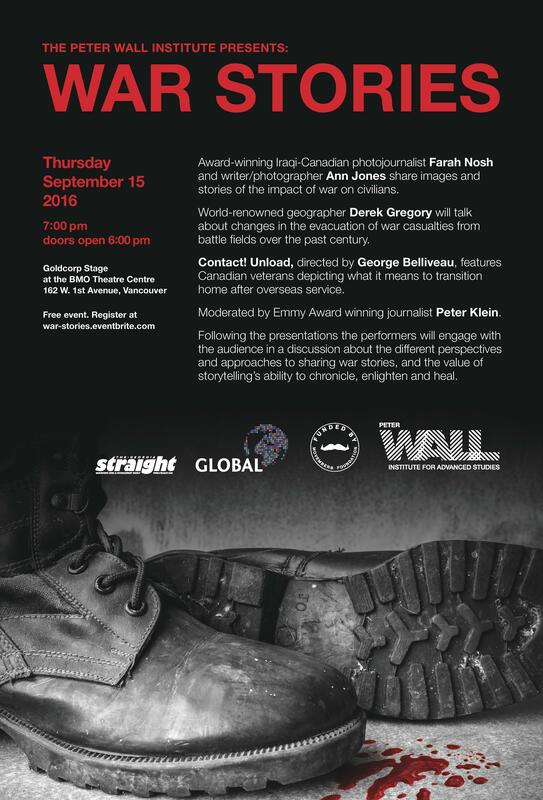 War Stories is a free special event to be held on Thursday, September 15, 2016, 7:00pm at the Goldcorp Stage at the BMO Theatre Centre. Sponsored by the Peter Wall Institute for Advanced Studies, the Global Reporting Centre and the Movember Foundation. War Stories from Afghanistan, Iraq and other conflict zones told by foreign correspondents, combat veterans and scholars. Award-winning Iraqi-Canadian photojournalist Farah Nosh and writer/photographer Ann Jones will share images and stories of the impact of war on civilians. Wall Distinguished Professor and UBC Geography Professor, Derek Gregory, will discuss changes in the evacuation of war casualties from battlefields over the past century. Contact! Unload, directed by Wall Scholar and UBC Theatre Education Professor, George Belliveau, will feature Canadian veterans depicting what it means to transition home after overseas service. The play highlights Marv Westwood’s Veteran’s Transition Program and artist Foster Eastman’s Lest We Forget Canada! mural. Moderated by Emmy Award winning journalist and UBC Journalism Professor Peter Klein. Following the presentations, the performers will engage with the audience in a discussion about the different perspectives and approaches to sharing war stories, and the value of storytelling’s ability to chronicle, enlighten and heal. Register for this free event at: war-stories.eventbrite.com.